After packing our bags on the last night of midterms, we all woke up bright and early to catch the 7:00 AM colectivo to start our journey into Corcovado National Park, a little up the coast from Osa Conservation’s biological station. We met up with our guide Maikol on the colectivo and an hour and half later we all got off in the small community of Carate and started our 20 km hike along the beach to Sirena station that serves as the main station for Corcovado. We first walked 3.5 km to La Leona station where we registered. Soon we took our first steps into Corcovado. The portion of trails running between Leona and Sirena station have historically had the most wildlife sightings and, for us, they lived up to the reputation. In the first half of our day we were able to see spider monkeys, squirrel monkeys, tent bats, and a few tamandua anteaters. Right before we stopped for lunch we ran into a Baird’s tapir resting in a mud pit. After ten minutes of watching it sleep, the tapir got up and walked within reaching distance of the group! 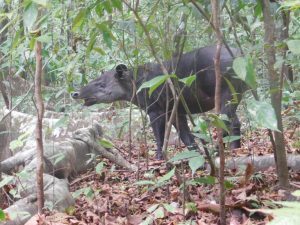 Photo 1: Juvenile male Baird’s tapir seen by students in Corcovado National Park. Photo by Max Beal. We took a lunch break on the beach and watched hermit crabs fight over our avocado pits as we waited for the tide to go down so we could continue hiking along the beach. When the tide was low enough we began to walk on the beach again but were soon stopped by a large rock outcropping. When the waves died down Maikol gave us the signal to run around the outcropping before the next set of waves came in. After our short run (and a little more hiking) we rewarded ourselves by sticking our heads in a river and taking a long drink. As the afternoon wore on, we had the chance to see much more wildlife including: magnificent frigatebirds, black hawks, three-toed sloths, and even a few crocodiles. 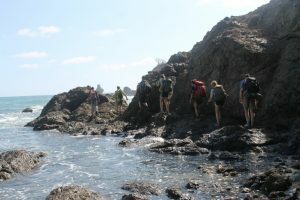 Photo 2: Hiking around rocky headlands on our way from La Leona to Sirena station. Photo by Max Beal. We reached Sirena station just as the sun was beginning to set and we watched it disappear over the ocean before we hiked up Sirena’s airstrip to the station. To protect both the people and the wildlife, visitors are required to camp on the platforms and can’t leave the station after dark. So, after we got in we treated ourselves to a dinner made by the Sirena staff and passed out. The next morning, we were up at 5:00 AM to start our day hikes on the trails surrounding Sirena. We ate breakfast out on trail and came back around 10:00 for a short nap and some lunch. That evening Maikol took us over to the swimming hole in the Rio Claro just east of Sirena. We swam until the sun began to set and on our way back to the station we ran into a second tapir resting in the roots on a tree. We all sat and watched (and took a few pictures) until the tapir decided we were a little too boring and wandered off into the woods. When we got back to the station we made dinner on the beach and put on a concert for the rest of the station before bed. The next morning was another early one so that we could fit in one last hike before we left the park. 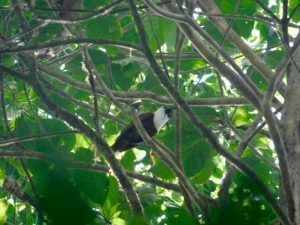 At the very end of our hike, Maikol heard the call of the three-wattled bellbird and, after searching for a short time, we were able to get a good look at one of the rarest birds in the Osa Peninsula. Photo 3: Three-Wattled Bell Bird. Photo by Chris Smith. After our morning hike, we walked back to Sirena, packed up our gear, walked to the beach, and caught a boat to take us to the town of Drake Bay just up the coast. We saw plenty of dolphins, birds, and got a good look at the coastline in the hour it took us to get from the park to Drake Bay. We stopped for lunch after the boat landed and then caught a bus back to Puerto Jiménez. After a few days of rest, we will prepare for our next adventure on our first finca.